Updated: I now have a 2017 version of this post here! From time to time, I like to do a post about my current favorite ways to make money with my phone. Who doesn’t love a little free money? All of these are really easy to use (I probably spend a few minutes of effort a day on this…really, not hard at all). The following list of apps is how I’m currently making anywhere from $3-5 a day with my phone. Not big money by any means, but a little extra pocket change never hurt anyone! You can see my past iPhone app posts here. Keep this in mind though when looking at old posts: these apps frequently change, including their potential earnings, how to use them, and what rewards you can earn. Note: Most of these include a link to download on an iPhone, so if you’re an iPhone user, it might be best to open this blog post on your phone…many of my links will take you right to the app store to download! This app has the best selection of gift cards to purchase I think I’ve ever seen – I’m using mine for Walmart and Amazon (hello, free grocery money! ), but there are a ton of choices. One note though – make sure you watch your data usage, especially if playing on multiple devices. You don’t want monthly data overages just to make a few bucks. Another fun app that’s tied in with Perk is the Perk Pop Quiz app. It’s just like it sounds – you answer trivia questions for money. If you need a quick time-killer, might as well make some money with it! You can sign up for Perk TV here, and use my referral code 16e05400 for 50 bonus points! Viggle – I’ve been using Viggle for over 2 years now – and we have a love/hate relationship. If you invest a little time in it you really can make some money with it. The bad news is, it’s constantly changing. It seems like just as soon as I get used to the way they do things, a program ends or changes. But, commit a little time, and it can be an easy money-maker. Viggle is kind of like Shazam…let your phone/tablet listen to your tv to see what you’re watching, and earn a point per minute you watch it (so check into a 30 minute show at the very beginning, and earn 30 points). You can earn bonus points on certain shows. I check into music too – you can earn 25 points per song (up to 20 per day). You trade in your points for gift cards (again, these have been really scarce lately, but if you catch them at the right time, they have a few great ones, like Best Buy, Starbucks and Amazon). I joined Viggle Nation a few weeks ago on Facebook that has been an amazing source of info and help with Viggle…I’ve easily doubled my earnings per day with the hints they give. Click here to download Viggle! 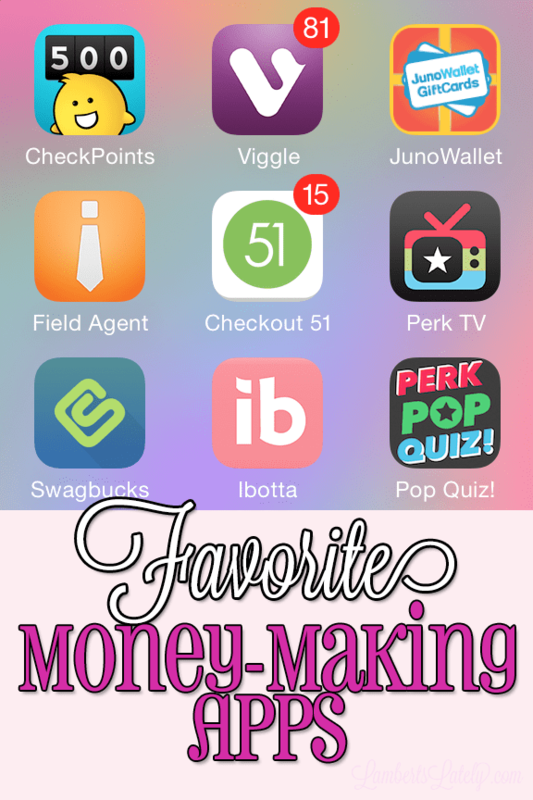 JunoWallet – This app has several different things you can do to earn money – download apps, like pages on Facebook, watch videos, etc. It’s fairly straight-forward, and can be a really good way to make easy money on your phone! Click here to download, and use the code LL731974 to get an extra $0.25 in Junocredits when you sign up! Ibotta/Checkout 51 – I put these two in the same description because they’re almost identical apps. Both of these list various grocery items…add the items to your list within the app, and if you buy that item, you can scan its bar code and your receipt into the app to prove you bought it and get a certain amount of cash back! They both often have generic items that I personally buy every week (milk, eggs, apples, etc. )…so you’re pretty much guaranteed to be able to get some kind of cash back from your grocery trip. Once again, free money! You can download Ibotta here. You can download Checkout 51 here. Checkpoints – This is another one I have a love/hate relationship with. To sum it up quickly, you check into places via the app for points. If you’re at a grocery store, you also have the option of scanning barcodes on certain items to earn points. It’s really easy to use, but depending on where you are, there might not be a lot of places to check into. We’ll get lucky occasionally and have what they call “gold star check-ins”…you get 5 times the amount of points for checking into these. It’s worth looking to see if you live in an area with lots of check-ins! Even if you don’t, scanning the barcodes at grocery stores can really earn you points quickly. They typically have a great selection of gift cards to purchase with points too! Click here to download Checkpoints, and use the referral code lflambert for a bonus! Field Agent – This is a fun one…you basically get to be a secret shopper and earn money doing it! It pays really well (usually a few dollars for only a few minutes of your time), and I think it’s really interesting to see what’s going on “behind the scenes” in stores. We’ve also gotten free meals and even a free grocery trip for participating in shopping trips. Click here to download Field Agent. Swagbucks – I’ve written about using Swagbucks before to earn money through lots of different activities…searching the web with their search engine, printing coupons through their site, watching videos on their page, etc. It has gone down some, but it’s still a great way to earn easy money. I’ve liked using their app lately too! It’s an easy way to use their search engine, browse their offers, and take surveys that earn Swagbucks (can be used to buy different gift cards, including Amazon). The Swagbucks TV app is good too…it’s very similar to the Perk TV app I discussed above, and seems to earn a little more than that app (but I don’t think this one can be run on multiple devices). Click here to download the Swagbucks app and here to download the Swagbucks TV app! Anything I’m missing guys? Comment with your favorites that aren’t listed here in the comments – you’re welcome to leave a referral code too! Shopkick is a good one!